Dora and her unwilling crew, including Diego. 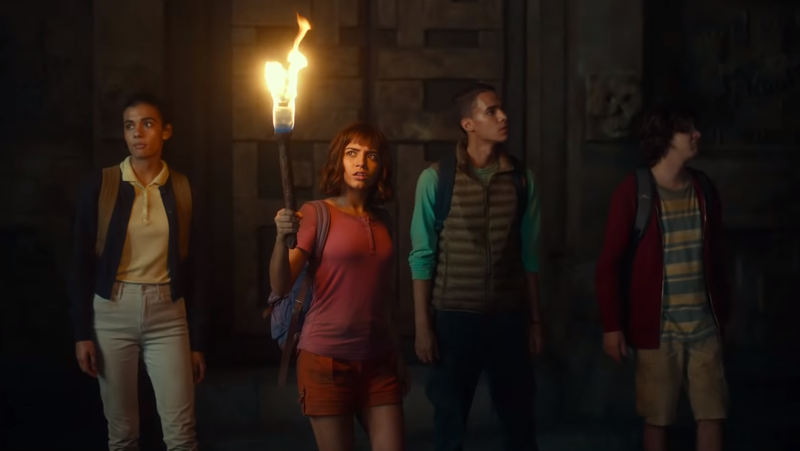 Seriously, sub in Lara Croft for Dora here and the premise would be almost completely unchanged: a teen Dora (Isabella Moner) is forced to go to high school while her explorer parents (Eva Longoria, Michael Peña) search for a lost city of gold. Until she and her friends (including her cousin Diego, played by Jeffrey Wahlberg) are kidnapped by dangerous mercenaries and forced into a jungle expedition featuring ancient ruins, mysteries to solve, and killers just two steps behind. With that said, this is way more lighthearted than the stuff Lara gets up to, murderous baddies aside. It seems like a fun time. Except that, strangely, Boots, the monkey, isn’t wearing any boots. Then why… why is he called that? That was like his only thing. Anyway, Dora and the Lost City of Gold raids its way into theaters August 2nd.